Although the American Civil War is generally regarded as one of the most important events in United States history, surprisingly few scholars of American Catholicism have studied it. Given that most scholarly attention focuses on Irish Catholic men in the Union Army, perhaps the least well-known aspect of the war is the role that Catholic women played in it. At the time, however, Catholic Sisters were well-known for their service as nurses during the war, with perhaps as many as one-fifth of all nuns in the United States serving in Union or Confederate hospitals. They were the only organized group of women in America with any serious amount of medical training. 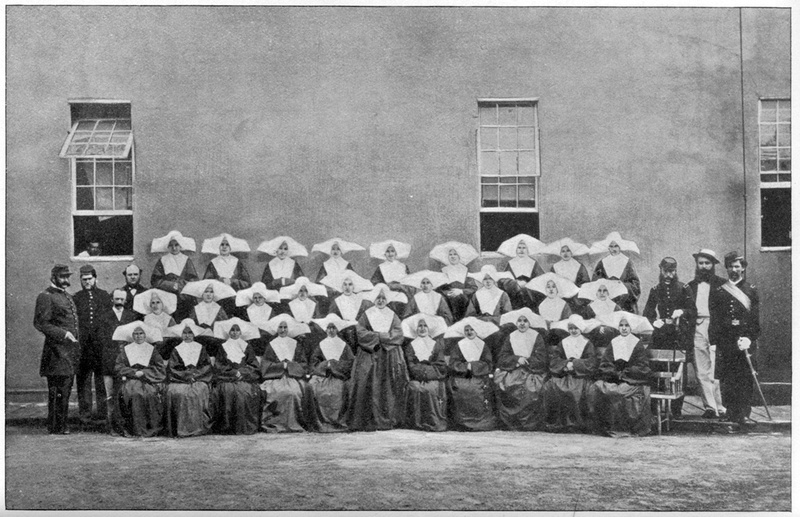 Despite their antebellum service in hospitals across the United States, however, nuns were also the most single vilified group of women during the period thanks to the publication of the notoriously anti-Catholic novel Maria Monk, or, The Hidden Secrets of a Nun’s Life in a Convent Exposed in 1836. Just two years earlier, a mob had burned down the Ursuline Convent outside of Boston, Massachusetts, when similarly scandalous and equally erroneous stories were spread about nuns who had been peacefully running a school for Protestant and Catholic children in Charlestown. Whereas many Irish leaders argued that the Civil War was a chance for them to prove their patriotism in the face of ethnic and religious prejudice, I wondered if the Civil War was a similar opportunity for Catholic women, especially the much maligned nuns. Certainly the Civil War did not dispel all prejudices against foreign- or native-born Catholics in the mid-nineteenth century. But it is clear that the nuns’ service had a positive influence on most of the Protestant soldiers, officers, and medical workers they encountered. When a statue of Lincoln was unveiled at his grave in Springfield, Illinois, in October 1874, federal and army officials included two Dominican nuns in the ceremony. These two women, again erroneously identified as Sisters of Charity, were given the honor of pulling down the curtain covering the statue at the end of the ceremony. Nuns were later granted pensions for their service and they received special markers for their gravestones thanks to the tireless efforts of Ellen Ryan Jolly, a laywoman, Ancient Order of the Hibernians Ladies Auxiliary member, and author of one of the earliest works on Civil War sister nurses. Finally, in 1924 with the blessing of Congress, Catholic leaders unveiled the “Nuns of the Battlefield” monument outside of St. Matthew’s Cathedral in Washington, D.C., commemorating the work of the many female religious orders who served during the war. It was a fitting tribute to the sisters for their hard work and dedication during the war despite all of the past popular misconceptions that plagued their daily lives in nineteenth century America. 1. Why did President Lincoln ask his surgeon general to appoint more Protestant nurses? 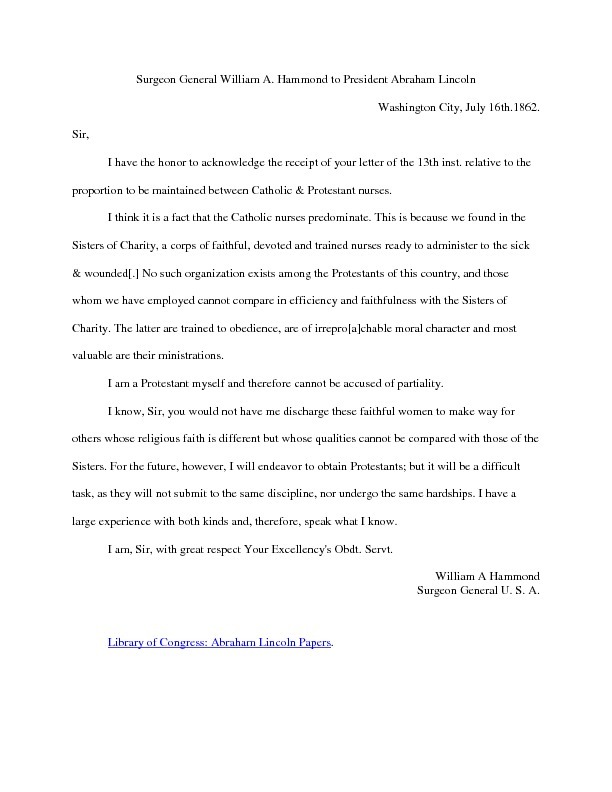 Did anti-Catholicism play a role in Lincoln's request? 2. Why were Catholic sisters so well-suited to working in hospitals as nurses compared to other women in American society? 3. Did the Catholic nuns serving as nurses have a positive impact on popular perceptions of Catholics in the United States? Why or why not?